Camo Jackets - Which One is the Best For Duck Hunting? Camo Jackets – Which One is the Best For Duck Hunting? Hunting is not exactly what you might call an “easy” pastime. There’s the chance you can get hurt if you’re not careful, and abrasions happen all the time. There’s also the cold to deal with, which can get precipitously dangerous. And of course, you also need camouflage so that your quarry doesn’t see you easily. And that’s where duck hunting jackets come in. The bad ones offer poor designs, they don’t offer adequate protection against the cold, and they don’t last all that long. But we have some good ones here for you to check out. Stormr is one of the more reputable manufacturers of protective clothing that gives you the mobility you need even in a very harsh environment. Stormr adapted the many lessons learned in producing the best outfits for divers and surfers and have adapted them to amphibious and land-based hunting activities. The most notable feature of this Stealth Jacket is its use of Neoprene. Just a very thin layer of neoprene is used, and that’s enough to provide the jacket an ability to keep its wearer warm and dry even in very cold and rainy weather. The neoprene cuffs on the inner sleeves also keep the water out. In key spots, the jacket also features material that’s resistant to abrasion. The camo design is also quite good, as you have several different types of plant life displayed on the jacket to help you blend in easily to woody or grassy environments. You also have two large pockets, call holders with tether, and an interior pocket for the ubiquitous cell phone that everyone seems to have these days. This jacket isn’t just for duck hunting. It can also help you out when you’re fishing as well. Just about all the reviews from real customers have raved about the Stormr Men’s Stealth Jacket. Now the Stormr Men’s Stealth Jacket can be a bit problematic if it’s not too cold, because it can be a sweatbox when worn. So when it’s not all that cold but you don’t want to risk getting wet, you can opt for the Yukon Gear Lightweight Insulated Jacket instead. What you’ll appreciate in the Yukon Gear Lightweight Insulated Jacket is that, while it can help you keep dry because it is waterproof, it also uses breathable material so you don’t sweat buckets when you wear it. But it is quite thick and it can really make you feel warm in cold weather as well. The two outside pockets are perfect places to tuck in your hands when there’s a cold wind blowing, and you can also get warm when you put up the hood. It’s made of 240-gram brushed poly tricot and 100% polyester, and the insulated quilted lining really does its job quite well. There’s also an inside pocket where you can put your cell phone in. The fit is comfortable if you get it in the right size, and it doesn’t get stiff the way some jackets do. The design is excellent too, and it can help you really blend in when you’re in woody areas. The front and back has a tree trunk design that looks truly realistic, with lots of leaves all around. 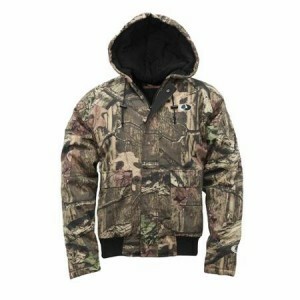 Now this Mossy Oak Camo Hoodie is truly versatile. You can use it for all types of hunting activities, as well as other outdoorsy stuff like riding horses, going on a dirt bike, riding an ATV, hiking, or for military games. With the face mask, some people even use it for construction jobs or when they’re puttering in the garden. They offer excellent protection against saw dust and highly pollinated areas. The built-in face mask isn’t for holding up your local convenience store, although a few wiseguys may think otherwise. That’s simply to keep your face warm in extremely cold conditions, and to protect you from the wind. When you’re not using the face mask, you can just tuck it in the neckline. The design employs the mossy oak breakup pattern that helps you blend in your surroundings, but you’re not just fooling the eyes of your hunting quarry. Every hunter knows that a lot of animals have an excellent sense of smell, and this camo hoodie actually keeps you odor free. That’s due to the special anti-microbial spray used to treat this jacket. You also get a large front pocket, 3-inch cuffs, and a ribbed waist hem. The soft material of the jacket is silent when you move. It’s US manufacturing at its finest. It keeps you warm, but you won’t feel stuffy inside it. Another excellent choice, but this time it’s for the ladies. The DRI Duck Camo jacket uses ultra soft Sherpa fleece to give you that warmth you crave when the weather takes a turn for the worse. It comes with a hood, and from top to bottom you have a jacket that makes you feel toasty warm weather you’re actually hunting outdoors or just doing a few errands in the winter months. The pockets are all Sherpa-trimmed, and you have an inside pocket for your cell phone as well. 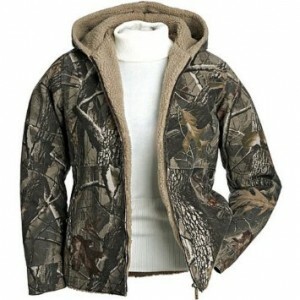 This jacket is tough enough for hunting use and even the metal zipper is designed for heavy duty. 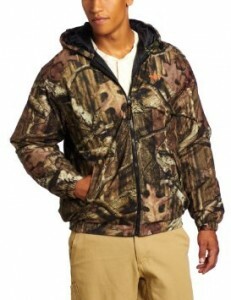 The design on the jacket offers the usual outdoorsy camo design. It bell-shape design is for more womanly figures. This jacket is beloved of women everywhere, as it helps them keep dry and warm in adverse weather. It’s touch, cozy, and stylish as well. Which Camo Jacket is Right for You? So which one is for you? 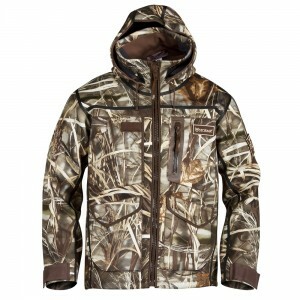 If you’re a gal, then the Women’s DRI Duck Camo jacket is the obvious choice. But for guys, it all depends on the conditions. For really cold weather, the Stormr Men’s Stealth Jacket is ideal, and the Yukon Gear Lightweight Insulated Jacket is perfect for less cold conditions. But when the wind is strong and you don’t want to breathe in pollen or dust, the Mossy Oak Camo Hoodie is great, and it even masks your scent as well as well as your face. Next story Which is the Best Layout Blind for Duck Hunting in 2016?